On February 29, 2004, director Errol Morris won an Academy Award for The Fog of War. Subtitled Eleven Lessons From the Life of Robert S. McNamara, it consisted of a one-on-one interview with the former Secretary of Defense as he looked back at his management—and mismanagement— of the Vietnam War. But as Morris took the stage to accept the Best Documentary Oscar, another war was on his mind. The invasion of Iraq had begun almost 12 months earlier, with the overly optimistic "Mission Accomplished" banner raised on May 1, 2003. "Forty years ago, this country went down a rabbit hole in Vietnam, and millions died," he told the crowd. "I fear we're going down a rabbit hole once again. And if people can stop and think, and reflect on some of the ideas and issues in this movie, perhaps I've done some damn good here." It was a noble notion that got the sort of polite, encouraging applause you'd expect from such a liberal crowd. But I imagine that nobody in the room (or at home watching on television) really believed that any film, even one as good as The Fog of War, could prevent the fast-approaching Iraq quagmire. Ten years later, it now seems clear that only one person back then did believe, or at least dared to hope: Morris himself. He has undoubtedly been disappointed ever since. One of the most respected and acclaimed documentary filmmakers of the last 35 years, Morris has divided his career into roughly two types of nonfiction movies: cockeyed portraits of eccentric individuals (see Gates of Heaven and Fast, Cheap & Out of Control), and sobering examinations of serious social and political ills (The Thin Blue Line and The Fog of War). But all his films reveal an overwhelming curiosity about people and what makes them tick. Whether it's Stephen Hawking (A Brief History of Time) or capital-punishment expert (and ardent Holocaust denier) Fred A. Leuchter (Mr. Death), Morris seems perpetually awed by our strangeness, and by the weird individual quirks that both define us and make us stand out from the crowd. He doesn't just look at his subjects—he seems to look through them, creating X-rays of their inner lives. I've always wanted to interview the man, but I'm scared to do so: I wouldn't want to meet him face-to-face, lest he be able to discern all my failings in an instant. His newest film is one of his strongest, because it brings together his two most prominent drives: It feeds the anger he feels about the bungling of the Iraq War, and it involves a person who's fascinating but also highly peculiar. But be warned: While watching The Unknown Known, his documentary about George W. Bush's Secretary of Defense, Donald Rumsfeld, the most likely emotion you'll feel is aggravation. For anyone like Morris who wants someone, anyone, to answer for the mistakes of America's foreign policy after 9/11, Rumsfeld would be an ideal "get." But Morris, who has made a career X-raying his subjects, has finally met someone who seems to be made of lead. In our culture, we've become used to those in the spotlight sitting down for high-profile interviews to come clean about past acts or set the record straight. (There's a sense that the interviewer, and the audience, is like a priest hearing confession and providing absolution—or a buddy offering a sympathetic ear.) That's why people may be thrown by Rumsfeld's demeanor here: He's not participating for either of those reasons. As he acknowledges at one point, he's not quite sure why he agreed to do the film. After seeing the result, though, I think the answer was that, once again, he just wanted to prove he's smarter than everybody else. Anyone who gritted his teeth during Rumsfeld's press conferences during the Iraq War will remember his tone. Smugly answering the press corps' questions—well, not answering so much as giving a response that reframed the conversation more to his liking—he always be having a ball, knowing full well that everyone in the room thought they could nail him, even though he was confident he could out-think them all. It was all a big contest to him, as if the legitimate concerns about the risks of putting American soldiers into harm's way were merely the backdrop for his condescending joust with reporters he felt were intellectually inferior to him. The Unknown Known is a 100-minute refresher course on the agony of the Bush administration's arrogance, as personified by Rumsfeld's cocky half-smile and mischievous glint in his eye. 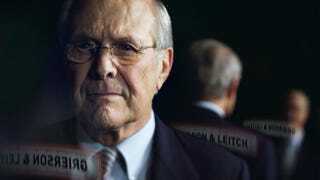 We don't normally hear Morris that much in his films—he prefers to let his subjects narrate the events—but the director's exasperation is palpable, especially since Rumsfeld is more coolly antagonistic than Morris' usual subjects. The film has been described as a cat-and-mouse game, but it's more akin to boxing or fencing, two adversaries parrying back and forth. And because Morris doesn't "defeat" Rumsfeld, it's very easy to assume that Rumsfeld wins. But the former Defense Secretary's victory is the hollowest kind, one that shields him from scrutiny, but brings no sense of justice or moral reckoning for those that he and the rest of the Bush administration casually sent out to the desert to die. (After all this time, the man still won't even concede anything about the lack of good intelligence on WMDs.) Morris has called The Unknown Known a horror movie, and he's not being facetious: It presents us with a truly brilliant, chilling man who has used his superior intellect to obfuscate what went wrong during 9/11 and afterward. You can't even accuse Rumsfeld of lying: His logic is so internally sound that to him, it all makes sense. According to Morris, when he first met with Rumsfeld, the former Secretary of Defense had some thoughts on Robert McNamara: "That man had nothing to apologize for." Clearly Rumsfeld feels the same way about himself. Yes, he "wins" The Unknown Known. But we all lost.